Have You Gotten a Butter Crock Yet? Remember when I went on and on about how I love my butter crock? Well, two years later I am still in love. I think the butter crock just might be one of my kitchen essentials. I can’t imagine my kitchen without it! 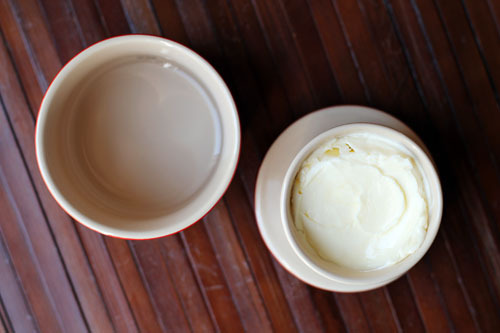 If you haven’t heard of a butter crock, click here to read my original post. Basically it’s a dish that keeps your butter fresh and spreadable at all times. It’s the best. The other day as I was spreading butter on toast, I decided I needed to do a butter crock giveaway. It’s time I spread the love (pun intended!). So, I emailed my friends at Le Creuset, and they agreed to help me butter you all up (yes, another stupid pun!). Two of you lucky, randomly-selected people will win your own Le Creuset butter crock. I just received one of my own and I love it even more than my original butter crock. It has a larger capacity, and there is a fill line painted on the inside for the water. I didn’t think I could love a butter crock more than I already did…but I do! To enter, simply leave a comment on this post before Midnight PT on Thursday, July 26. (U.S. shipping addresses only, please.) Two winners will be announced on Friday, July 27. Good luck! And Happy Buttering! I totally need one of these! Best. Ever. We have a butter problem to say the least! That is so neat!! Would love to win – thanks. This is PERFECT!!! Would love one! YAY for contests! would love to win one…. I am OBSESSED with these, but still haven’t bought one for some reason. I would love this! I have been thinking about getting one of these – would love to try it out! I want one of these so bad, I can hardly stand it! Hmmm, this would help me now that I buy butter from the farm, so it’s not in sticks. I’ve had it go rancid on the counter, yuck! I’ve never had a butter crock but would love a RED one! I’ve never heard of a butter crock – what a genius idea! I’ve always wanted one of these! And this one is so pretty! Simple pleasures- sounds like such an upgrade to greasy butter chunks in the fridge. Thanks! I’ve been having butter “issues” this summer, and the butter crock looks like it will solve them all. Thanks for a fun giveaway! Very cool! I’d love one of those. This is such a great idea. Our butter dish is so old and disgusting. Awesome – I’d love one! I would love one, especially the red one! I have never heard of this thing before, but I like the sound of it! I love Le Creuset and I would love one of these! I have always wanted one of these. And a salt cellar shaped like a pig. Love! Would look fabulous in my new kitchen! I love Le Creuset and would love to win this! oh how cute! I haven’t ever seen one of these before, but I love it. I love this!! So cute. I would totally love to win one! I got my mom one of these, but I have yet to buy one…but I think it would be great! I love butter. I love Le Creuset. Sounds like a match made in heaven!!! What a lovely offer Jane! This is a beautiful dish and undoubted one for beautiful cooks and beautiful kitchens. I’ve been a kitchen equipment enthusiast for long but the really good news for me is that my son has recent taken to the creative world of cooking…I’m so happy about that! Ooh, so cute- would love one of these! I want one so badly!! Very cool!! Would love to win this! How fun! My grandmother used to have of these! I love a butter crock! Mine cracked last year and have yet to replace, so would be so happy to have a lovely Le Creuset one to replace. Thanks! I would love to win this butter crock! Oh how I love these! I still don’t have one of my own yet, I remember telling myself when I saw your original post that I was going to get one. Alas, that never happened. Ah well! These are so cool! I’ve wanted one for a long time but never took the plunge. So cute and functional! Love this! YES! I love soft butter and I LOVE Le Creuset! I’ve heard wonderful things about butter crocks, but have yet to get my own 🙁 with 3 kids who LOVE toast and HATE hard butter this would come in handy! Love anything Le Creuset and anything with butter! Thanks for sharing. Do they have child proof latches for butter crocks? I am pretty sure if I win, my children will use it as their own personal butter trough. What a fantastic product! Thanks for introducing it to me, and now…I must have one. I love the butter crock! I’ve given them away in wedding gifts but never gotten one for myself! Love it! Ooh, I’ve been eying one of these! 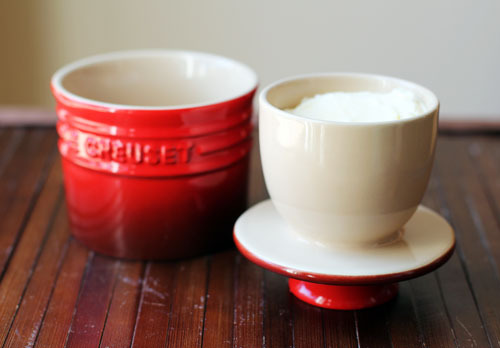 Butter and Le Creuset…does it get any better than that? Yes, please. I NEED that red one! I never knew something like this existed! I would love to have one! I was just visiting a friend and she was going on about her butter crock. It’s on my list! WHA? That is awesome!!! How do I not own one of these already? Fingers crossed! 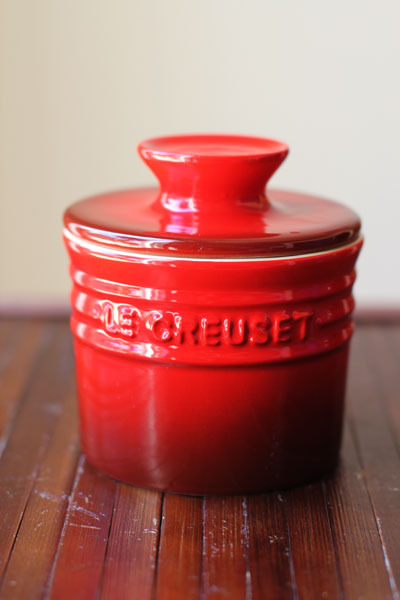 I would love a beautiful red Le Creuset butter crock! My fingers are crossed! You learn something new every day! If you say that I need this, then I need it! We always leave butter out in the cupboard but this looks a little nicer. Until now, I had never heard of a butter crock, but it’s a great idea. This is something I need! Thanks! I’ve always wanted one of these! My MIL has one and I think it is so cool! Thanks for another great giveaway! I’ve been wanting a butter dish for ages, but this is way cuter. I love it. Pick me! Pick me! love me some le creuset (and butter)! This looks really neat!! Would love to win! Oh pleas random generator pick me pick me! Thanks for the giveaway. Cold butter on warm bread is no fun. I have wanted a “butter bell” for YEARS. Not sure why I don’t have one yet! 🙂 Thanks for the giveaway. I didn’t even know I wanted one until I saw this post! Le Creuset? Butter crock, you say? The most beautiful words in the English language …. and French …. must. win. S’il vous plait? ok…this little butter crock is adorable. and of course, my bread would thank you later if i won. great giveaway jane! Wow, I’ve never heard of this… how utterly cool and now I would like one! Please?! 🙂 Thank you for the opportunity and love the puns! Happy weekend! Two, you get to giveaway two!?! I remember reading your first butter crock post a few years ago and then I happened to visit San Francisco and I saw a butter crock in a store and I wanted to buy it, but I let the husband change my mind. So many times since then I’ve thought about it, but just never taken the plunge. I’ve never heard of this, but I NEED one! If I don’t win, maybe I’ll just go ahead and buy one. Thanks! I NEED one of these! It would make life so much easier! I’ve never even heard of one, but what a great idea! I didn’t know such a thing existed. How handy!!! I so heart Le Creuset! I need me a butter crock too! Ah those are awesome. Would love to win one too. I really need one of these, I make grilled cheese sandwiches for my two boys everyday and I hate it when I forget to put the butter back in the butter dish so it is spreadable. Growing up, my family had one of these, and I would love to add one to my own household. I never knew I needed one of these! But I am pretty sure I do. How fun! I’m a relatively new reader and had never heard of these before. Oh…I so want one of these! Sounds like a great idea for the kitchen!! Wow, what an amazing concept! I would LOVE one of these. I have not seen one of these any where. Sure do like it. I live in central Texas and have looked at these but I just can’t see how it would keep the butte fresh. 🙂 Make me a believer. My friend bought one last year and has raved about it ever since! Thanks for the chance to win! Such an awesome giveaway !!!! Now this is a cool giveaway. Count me in! Would be such a great addition to my kitchen! 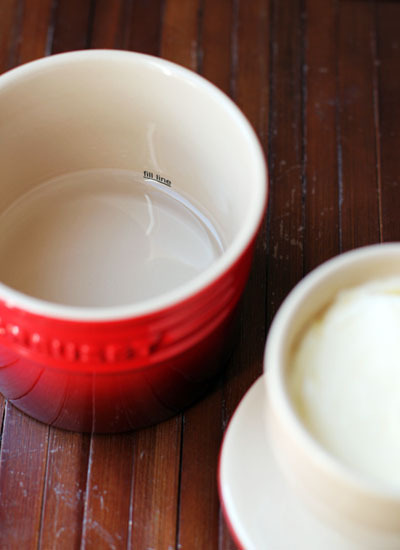 I LOVE love love this butter crock… Wishin’ and hopin’! I remember my great-grandmother having one of these – it was passed on to my grandmother and then to one of my aunts, but I think one of my cousins broke it when they were kids! What a great memory – and a great product! This would certainly make mornings easier! To think, I could eliminate the messy butter in it’s wrapper…sometimes on a plate …sometimes in a greasy spot…on the counter for this wonderful butter neatness!! I am so psyched! I never knew this exsisted….a butter crock? All I can remember is a dish with a stick of butter laying there. What does the water do? How does it work? I have never seen one of these, but I love the concept!! Thanks for the chance to win!! I would love to have a butter crock to set on my counter! I have a small collection of butter crocks. Aren’t they so neat to put on the table. I’ve never heard of a Butter Crock and am utterly fascinated! Would be nice to have one for butter that does the job! I don’t have a butter crock but now I see I definitely NEED one! I’ve heard of these, but never seen one. I’d love to have one! I have wanted one of these for a long time! I got one for my in-laws, but have never purchased one for myself. A great giveaway! Thanks! Thanks for this absolutely wonderful offer. OHH!!! I have to have this! I’m always leaving butter out on little plates on my kitchen table, lol. I would LOVE this! Ok this is so cool!! I get my butter fresh from a local farm and this would be so cool!! Thanks for the chance to win one!! I have wanted one of these forever! I would love to have one of these butter crocks. Great giveaway would love my name added into the draw! Would LOVE to win this!! What an awesome gift. Please pick me!! I once had a butter crock. And then it broke. I miss my butter crock. What a nice give-away! I would love the chance to win one! What a great idea!! Wow, pretty sure I need this! I have never seen one of these! Love!!!! Wow! I would love one of these! Thanks! This is beautiful. Great addition to my kitchen. Sounds really great! I know I would love this! Never heard of one of these! What a great item to have! My sister-in-law has something like this and they call it a butter bell…but they’re from Tennessee. I have never heard of this before, but pretty sure I need one! I would love this I am always using olive oil for cooking because I don’t have any room temp.butter. There are some things that butter is better for. I would love this…my grandmother had a glass dome one when I was growing up and at that time they made round butter that fit perfectly in it!! i would love to have one of these. thanks for the chance. Wow, I would love one of these!! This would be such a great addition to my kitchen! Thanks for the opportunity. this sounds horrible, but I have never seen a butter crock before,but it looks awesome! I love butter and would love this. It’s amazing how much crispier your toast stays when you use butter rather than butter-like spread…yum! I would love to try one!!!! I LOVE my Le Creuset dutch oven, and one of these butter crocks would go perfectly with it! I’ve never seen one of these before, but I’d love one! I was given one as a gift and like it, but would LOVE to have one with a fill line. I never know how much water to put in. oooh! I want to try a butter crock. I am sick of trying to scrape my butter out of the butter dish. I would love one! I never seem to have the right consistancy with spreading butter. Love your blog! My father in law has one of these and loves it! I didn’t even realize there was a thing called a butter crock. I keep my butter in a Tupperware container. No more, I say! my family loves butter! Yum! This is the first time I’ve heard of this. Sounds so wonderful. I know I’ll never be picked as a winner (I live really far away to ship it.hahahahahaahah) but I just love your site and this is a really cool idea. Will try it with something here. Thanks. I have never used a butter crock but I like the idea of it. Oh my god oh my god oh my god I neeeeed one of these. I’ve been trying to explain how magical these are to my husband but he just doesn’t get it. Maybe if I get one for free he will be more understanding! I have always used a tupperware to hole the butter. This sound a lot neater. Ooooh! and I LOVE the color! I would love this:) Thanks! What a great idea and nice beginning to LeCrueset collection. Really cool, would love to have one! This is one thing I don’t have and keep putting off buying one…Could I use this! I used to sell these back in the very early 80s at a cookware store while working my way through college. We sold a ton but I never bought one for myself, and always thought I was missing out. Maybe now I’ll have the chance to experience a butter crock for myself! Yes, yes, yes! I’d love a butter crock! I’ve been wanting to try one for a long time, just haven’t got one. Please pick my sister!!! This is just the kind of thing she would go crazy for! Me too, but I don’t have a US address. I’ll have to look for one here. How cute and purposeful! I would love to win one of the butter crocks! OMG! I love this butter crock! I have never used one and am excited to (possibly) win one!! I just found your blog today and love it! I love the idea of a butter crock and am throwing my name in the hat for one. Who doesn’t love a butter crock! I’ve always wanted to try one. Thanks again for another great give away! Would love to try this crock, my butter gets too mushy in a regular butter dish on the counter here in Texas! I want one!! what a wonderful kitchen essential! This would be great!! I’ve never used one!! I would love a butter crock. I have one of their cast iron pots and love it. Would love me a butter crock! I have always wanted one of these! Pick me! I love butter that’s spreadable! This is just what I need! I would love to win one!!!! My 90-yr-old aunt would love this! Pick us! Yes!! My sister has one and I’m so jealous! These are the best! I would love to give this to my younger sister (and then buy one for myself!). I think this would be fun to try. These are gorgeous! I would love to win one! I must have been living under a rock all my life because I had never heard of i this….. and I am in love with the idea of it. Would love to win it. Plus the red will match my kitchen ;-)Thanks. Awesome! Thanks for spreading the love! That would be amazing to have! My husband is always using little knives completely hacking up the stick of butter and this would cure that! I’ve been eyeing this lately! LOVE! This is great we could use one of those. I love the idea of a butter crock! Thanks! I would looooOOOOooooove a butter crock! This just makes so much sense! Looks awesome! I hope I win! Very nice. Count me in! I have been wanting one of these and love this brand! Would love to try using a butter crock. I need a butter crock! The fill line is a great idea. It seems like such a simple product, but after your original butter crock post, I bought one (not Le Crueset) and I just can’t figure out how to keep the butter in the bowl. I stopped using it long ago because it just wasn’t working for me. this sounds genius! i hope i win! I have never heard of this, but it sounds wonderful! Yes please, I love Le Creuset and butter!! I’ve heard some great things about these, and would love to give one a try! This would be neat! Thanks! I’ve never heard of a butter crock before and I’m wondering why…it’s seems like such a great way to store butter. We love our butter crock too, though that Le Creuset one is much nicer! Great giveaway! this butter crock would be a great addition to my kitchen 🙂 Thank you! Love your site! I love this!!! I’ve been on the lookout for a decent one since Thanksgiving (my aunt had one and I fell in love!). Looks fantastic and I would love to try one. I’ve never even heard of this before. Genius! And it would match my tea kettle! These are amazing! How did I now know they existed before. Giveaway or no giveaway, I will have butter crock. Oh wow! I need this! I mean…I really NEED this! Plus it’s super cute and would look great in my kitchen! Haha! My mom has one of these and I’ve always thought it would be nice to have. Great giveaway, thanks! Been wanting one of those forever! So cute and convenient. I’ve always wanted a butter crock but considered it one of those kitchen items I could do without, so have never brought myself to buy one…..would love to give it a try though! I gave a butter crock to my husband as part of his wedding gift, along with a promise to always have breakfast with him before he goes off to work. The outside part took a tumble and cracked the other day (I won’t point fingers but it wasn’t me). Your timing could not be better. I’m a butter lover too and the crock concept looks like a good idea. This is such a great idea! I’d love to have one! What a great idea; I know this sounds silly but soft butter reminds me of dinners at my grandma’s house, with rolls that she spent all day Saturday making. I miss those days! I enjoy butter, real butter & not the fake stuff. We struggle with butter at our house. I hate leaving it out too long but then I always forget to take it out. Then when I try to micro it, I end up melting it. This seems like it would solve all my problems- thank you! I have been wanting a butter crock ever since your original post about it, would love to win this! I’d never heard of this! I’d love one. Never heard of it! Great idea! I am constatly fighting with my butter….holder…thingy! My grandma had something like this! I’d love one! We love butter so this would be awesome! I love to use butter instead of margarine on my toast, but always too hard from the refrigerator. A butter crock? Perfect :). I have always wanted one of these! I hate putting hard, unspreadable butter on the table. I remember your original post about this butter crock and have always wanted one. I would be thrilled to be a winner! I would love to have a butter crock! I’d love to win the butter crock. I’ve been wanting to get a butter dish for a long time but haven’t gotten around to it, and thank goodness! What an ingenious idea! I’d love to have a butter crock! I was just on vacation and looking longingly at all the butter dishes at the different family members’ houses we stayed at. That butter crock looks even better! How fun! I’ve never heard of one before! How I love Le Creuset!!! I would love one of these. Thanks for the opportunity! Interesting and you leave it on the counter? Like the size and bright color. I’d love to have one of those. Oooh, Ooohh, please pick me! I have been wanting one forever, and it is just never in the budget. I had one many years ago that cracked and broke, but it was wonderful. Would love it! It’s so cute! Growing up, I had a friend who’s French mother was an incredible cook. She always had spreadable butter and just figured it was a culinary secret. Well, now I know the secret and would love to add a crock to my bag of tricks. My Aunt had one of these in her kitchen years ago – I always loved it! I didn’t think they still had them! These look so awesome, but I’ve never had the opportunity to check them out! I never knew there was such a thing. I totally need one. Ooh, I’ve been wanting to get one of these! Thanks for the chance to win! Wow, never heard of this, but would be an awesome thing to have! Any product that means I can always have spreadable butter on hand is a must have. Would love to have this lovely crock grace my countertops! I have always wondered how well those work. Thanks! I would love a butter crock…we are butter fans in this house! I’ve been wanting to get a butter crock, this would be great!!! I love butter! Did not even know about these! Want! Ooh! Love it! Need it! I LOVE KITCHEN TOOLS! Anything that makes things more organized, available, or useful makes me soooo happy! I would love this and that is no crock! Would love to try one of these out! Love butter! Huh, I never knew these existed! Looks like something that would get a lot of use around here. Thanks! I just found your page and I love it! And this butter crock looks wonderful!! Nothing worse then hard butter when you have warm treats 🙂 I’m sure if I had a butter crock I’d make more muffins! Le Creuset and butter…what could be better?!? I’d love to have a butter crock! My mom has a butter crock and I’ve always wanted one. Seriously, the butter is so spreadable and great. I’d love one! I would be so very happy to win a butter crock…and it would make my love of butter more convenient. Yum! Soft spreadable butter on toast is always good. I was thinking of getting a butter dish, but this looks neater. What a great way to have soft butter all the time! My husband will be over the moon when he learns about this nifty little tool. We fight about our current lack of a butter dish or spreadable butter all the time. Count me in! I’ve always heard of these, but never tried one. OK, you’ve convinced me that I really NEED one of these crocks! I gotta see it to believe it. I love butter crocks! They keep the butter so fresh and spreadable. I just stumbled upon your blog for meal planning. This butter crock looks amazing! Oh How cool. I love to make my own butter and I enjoy making it with my preschoolers every year. Oh, I need this! Fingers crossed. That would be PERFECT! Churn up a winner! This would be a perfect addition to my kitchen! I Love le creuset! I had no idea they make one of these! I love Le Creuset’s products. I might get this.